In Travel Express Investments Inc. v. AT&T Corp. (5D08-2504), the Fifth District addressed "whether a forum selection clause, which provides that '[t]he parties consent to the exclusive jurisdiction of the courts located in New York City, USA,' is mandatory or permissive." 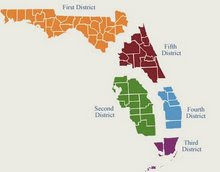 In order to “‘provide a degree of certainty to business contracts by obviating jurisdictional struggles’” and to give the parties to a contract the ability “‘to tailor the dispute resolution mechanism to their particular situation,’” the Florida courts recognize the right of contracting parties to select and agree on a forum in which to resolve future disputes. Mandatory forum selection clauses require that suit be filed in the forum named in the clause. Golden Palm Hospitality, 874 So. 2d at 1236. “As a general principle, a trial court must honor a mandatory forum selection clause in a contract in the absence of a showing that the clause is unreasonable or unjust.”...On the other hand, permissive forum selection clauses are essentially a “consent” to jurisdiction or venue in the named forum and do not exclude jurisdiction or venue in another forum. The general test for determining whether a clause is mandatory or permissive is the use by the parties of language indicating “exclusivity.” Golden Palm Hospitality, 874 So. 2d at 1236. “Absent such language, the clause will be considered permissive.” Id. If the forum selection clause “state[s] or clearly indicate[s] that any litigation must or shall be initiated in a specified forum,” then it is mandatory. Shoppes L.P. v. Conn, 829 So. 2d 356, 358 (Fla. 5th DCA 2002). If, on the other hand, a venue clause is determined to be permissive, then it is “nothing more than a consent to jurisdiction and venue in the named forum and do[es] not exclude jurisdiction or venue in any other forum.” Regal Kitchens, Inc. v. O’Connor & Taylor Condo. Constr., Inc, 894 So. 2d 288, 289 (Fla. 3d DCA 2005); see Garcia Granados Quinones v. Swiss Bank Corp. (Overseas), S.A., 509 So. 2d 273, 274-75 (Fla. 1987). The clause in the instant case specifically provides that the parties consent to “the exclusive jurisdiction” of the New York courts. This exclusivity provision clearly makes this clause unambiguous and mandatory. Moreover, we see nothing in the record to suggest that enforcement of this clause would be unfair or unjust. Accordingly, we reverse the order denying the motion to dismiss for improper venue and remand for entry of an order dismissal.